Listen to "Not My Boy! 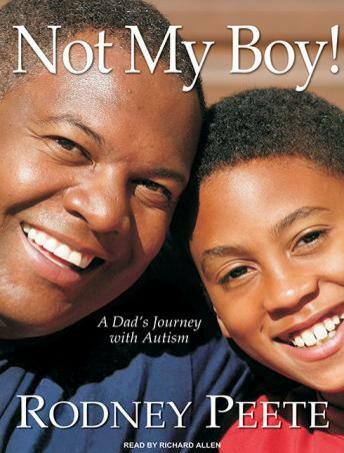 : A Father, a Son, and One Family's Journey with Autism" on your iOS and Android device. Autism affects four times as many boys as it does girls. For their fathers, expectations and hopes are drastically changed-NFL star Rodney Peete's were when his son R.J. was diagnosed at the age of three. After a period of anger and denial, an all-too-common reaction among fathers, Rodney joined his wife, Holly, in her efforts to help their son. With determination, love, and understanding, the family worked with R.J. to help him once again engage with the world. Eight challenging years later, R.J. has gone from the son one doctor warned would never say, 'I love you,' to a thriving, vibrant boy who scored his first soccer goal while his dad cheered from the sidelines. Very touching & realistic account of a real family facing the world of autism. Highly recommend it for male & females!